Windsurfing is most well-known water sport and by far the toughest, despite being non-mechanised. It is relatively inexpensive, but wind-surfing can be a very frustrating sport to learn. It is a unique combination of sailing and surfing, requires commitment, good health and a good instructor. Mostly foreign tourists tend to windsurf in Goa. The popularity has made the windsurfing Regatta now an annual event. The open board sailing competition lasts for about a week in Goa every year. 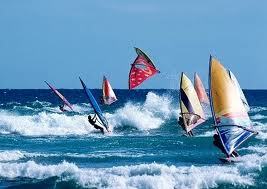 In Goa October to March is the best time for Wind Surfing. For beginners, the Dona Paula beach is ideal for surfing, as advised by most of the windsurfing trainers and experts. This is because, the water conditions at this bay, is almost lake-like and the breeze is light and steady. These kinds of conditions are just right for beginners and usually prevail in the mornings. During the afternoon, the winds grow stronger and offer a perfect challenge for the experienced surfers. There are 3 to 5 day courses that are held here. If you wish to learn this sport, then you can enroll yourself into one of the courses. The Dona Paula Beach is one of the best sites to learn and perform Windsurfing activity. Some more Ideal places for Wind Surfing in Goa are Bogmalo beach, Miramar beach, Calangute beach, Arossim beach, Utorda beach, Benaulim beach, Vagator beach, Colva beach, Pololem beach and Baga beach are ideal locations. Rates starts from Rs.300 – Rs 600 per hour, depends on agent and your negotiation skills. *Note: The rates are subject to change and are for information purpose only. Windsurfing Regatta is an event that is held every year in Goa. This event includes the Windsurfing competition and the Open Board sailing competition that runs for a week. The rising growth of this sport among tourists and locals has been largely responsible for this event. Double check the gear before starting. Learn the international distress signals.